The Newt Davidson Collective Collection contains a PDF of Crisis at CUNY, the audio and transcription of an oral history interview, and a photograph of the interviewees. The original members of the Newt Davidson Collective (approximately fifteen in total) were young and untenured faculty members and knew each other from CUNY and from anti-Vietnam War activities. 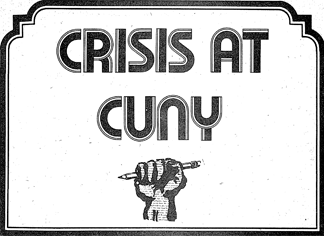 They united around issues related to CUNY and in 1974 began to produce a few pamphlets (still missing) that were critical satires of CUNY administrators and their policies. Their name is mocking David Newton, a CUNY administrator who "had come out with something horrible..." Using first names only, they collectively researched, wrote, produced, and distribute Crisis at CUNY. As the 1970s wore on, students and faculty at CUNY found themselves faced with an ominous environment. While the open admissions struggle of the late 1960s represented a signal achievement in the struggle to secure democratic access to quality higher education, now rising costs, overcrowding, layoffs, and other cutbacks threatened this ideal. Crisis at CUNY grew out of the research of the Newt Davidson Collective as they sought to understand reasons for this new climate. Their search took them deep into the complex bureacracy of the City University and its links with other key institutions. The booklet would go on to circulate among CUNY professors (who used it in teaching), radicals, and others, influencing an entire generation at CUNY. There are 3 items in this collection. Go to all 3 Items in collection.